So here’s a loose roundup of some of the books we’ve had on our pile over the past several months. I have the entire stack of Very Fairy Princess books by Julie Andrews and her daughter Emma Walton Hamilton from a GeekMom event a few years ago. 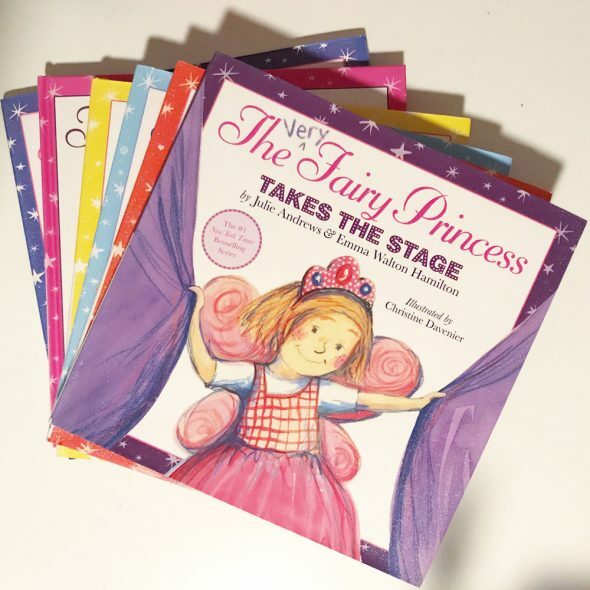 I had tea with Dame Andrews and her daughter when The Very Fairy Princess: Graduation Girl was released a few years ago and received several of the books. H really discovered them this summer, and we made our way through The Very Fairy Princess, The Very Fairy Princess Takes the Stage, The Very Fairy Princess Sparkles in the Snow, The Very Fairy Princess Follows Her Heart, The Very Fairy Princess: Here Comes the Flower Girl, and Graduation Girl in fairly heavy rotation. I just today ordered The Very Fairy Princess: A Spooky Sparkly Halloween. 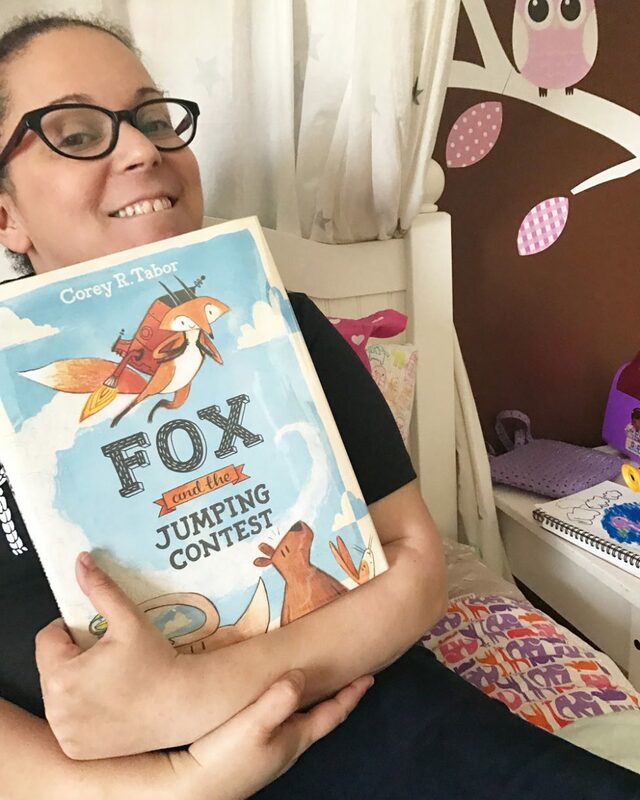 We were into Fox and the Jumping Contest by Corey R. Tabor for a good stretch over the summer. This was my absolute favorite Wonder Woman book to read with H after the movie came out. Wonder Woman: I Am An Amazon Warrior only tells the story of the movie up through Diana’s departure from Themyscira. Which was perfect for me, I wasn’t quite ready to talk to her about WWI, and why Wonder Woman had to get involved and save the world. She’s a very innocent 5, but she knew Wonder Woman was just everywhere in early summer, and she was curious. She loves superheroes in a DC Superhero Girls kind of way, so this book was great for her. 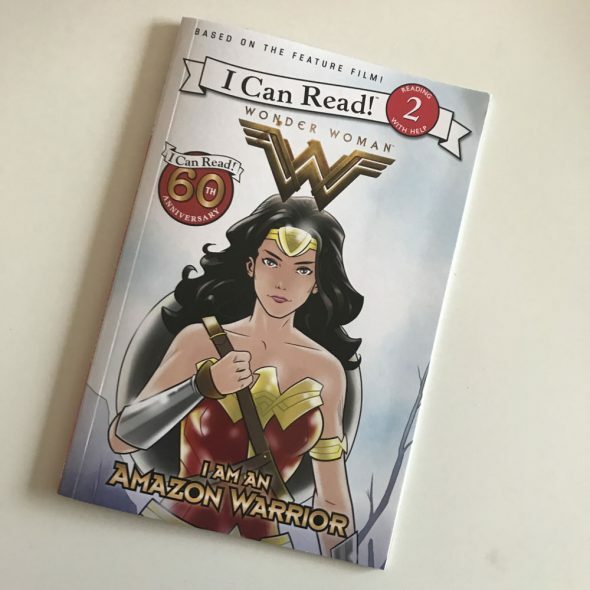 It got the girl power, female warrior essence of the Amazons down in a way that was short and accessible for her, and she was just inspired by “Wonder Woman Island,” as she called it. Amy Krouse Rosenthal. Her loss was such a punch in the gut for the kidlit world, and H just happened to hit her unicorn phase a couple of months later. 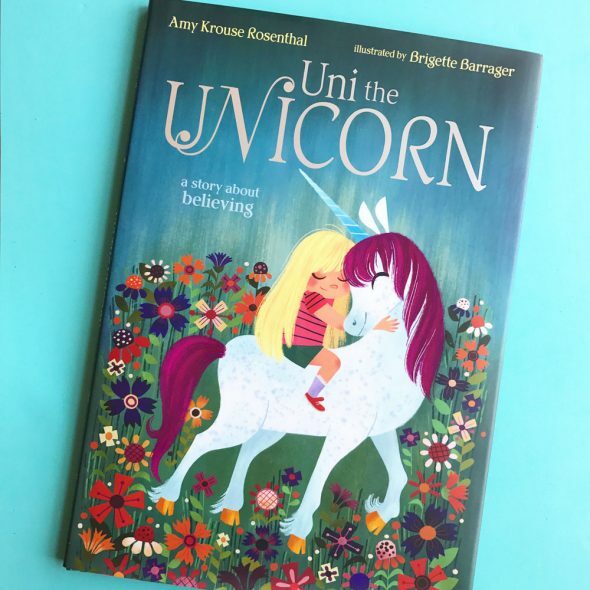 We already had Uni the Unicorn on our shelves, I’d read it to my students as a school librarian and loved it. But she hadn’t been reaching for it. And then suddenly, she was wild for unicorns and it was all we read. For months. Over and over and over. We have a Uni stuffed doll. We preordered the sequel, Uni the Unicorn and the Dream Come True. “The sparkle of believing” is possibly the most wonderful phrase in all of children’s literature. Adam is next to me while I type this, and as soon as he saw Uni he started throwing out quotes. “And of course of course of course, sliding down rainbows.” We are just smitten, and I’m devastated that this is it for Uni (but secretly hoping Rosenthal finished a 3rd book I just don’t know about). 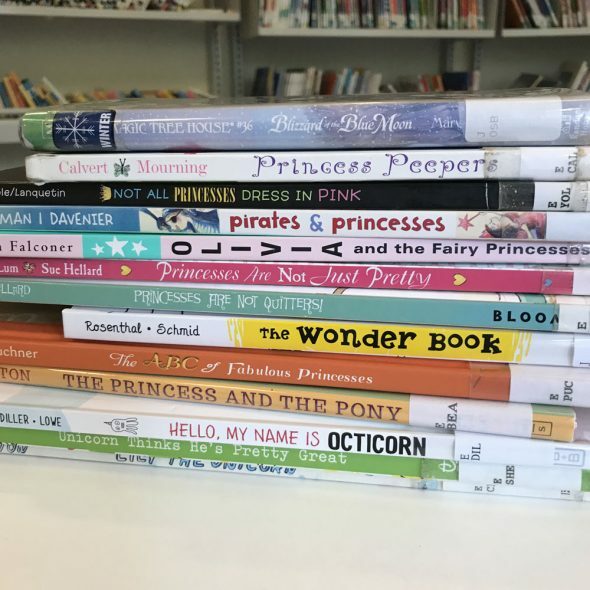 This is a great big stack of books we kept renewing from the library, but the important thing here is PRINCESSES and UNICORNS. We are in the full throes of a princess, unicorn, mermaid, magic phase of childhood, and as skeptical as I can be about little girl princess culture, I have to admit that it is pretty adorable. Sometimes H is a princess who is trapped (and we have looooong talks about not waiting for a prince to rescue you). Sometimes H is Princess Diana of Themyscira. Mostly she’s just Princess H, who goes about her life in the most fabulous way possible. Our other biggest obsession around here are the Princess in Black books by Shannon Hale (of the Princess Academy books) and Dean Hale. We. Love. The. Princess. In. Black. She is a princess who secretly transforms into a ninja to stop monsters from terrorizing her kingdom! She is amazing! These books are hilarious and charming, and they are early chapter books you could easily read in a sitting. One of my favorite activities has become curling up with H while she snuggles and follows along with the princess. The Princess in Black and the Perfect Princess Party, The Princess in Black and the Hungry Bunny Horde, The Princess in Black Takes a Vacation, and The Princess in Black and the Mysterious Playdate. We love them all. I should probably write a whole post on how much we love some of these books. And that’s what we’ve been reading the most lately. We’re working on Ella Enchanted off and on, but H’s attention span isn’t quite there yet. We’re rereading The Complete Tales of Winnie the Pooh for about the 50th time. We’ve also been listening to a ton of fairy tales on Spotify, which is really fun. They have two playlists we like a lot, Fairy Tales and Once Upon a Time. Some of the stories are retellings of the Disney movie tales, but most of them are actual fairy tales in audiobook form. We listen to them on the way to school almost every morning, and love them. And that’s what’s been on our pile basically since school ended in June. And a few that have been sticking around even longer than that. I need to keep better track of the books we’re loving going forward, we’ll see how I do with that.